David Weekley Homes recently hosted an event in the community of Village of Belmont to collect items for the Toys for Tots Drive. Homeowners and team members donated toys and enjoyed hot cocoa and cookies, decorated ornaments and had photos taken with Santa. In the Mableton community of Vinings Brooke, a festive breakfast was held with brunch and community activities. Each guest in attendance was asked to donate a new book or pajamas. Items that were collected were donated to Pajama Program, a nonprofit organization that has provided more than four million nurturing books and warm sleepwear to children in need. 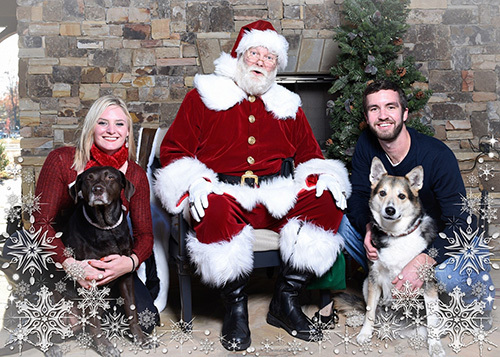 Attendees at the David Weekley Homes event in the Village of Belmont brought their four-legged friends to have their photo taken with Santa.